On 21st January 2019, members of the SUEUAA team joined other projects funded under the British Academy's Cities and Infrastructure GCRF funding call at British Academy headquarters in London. 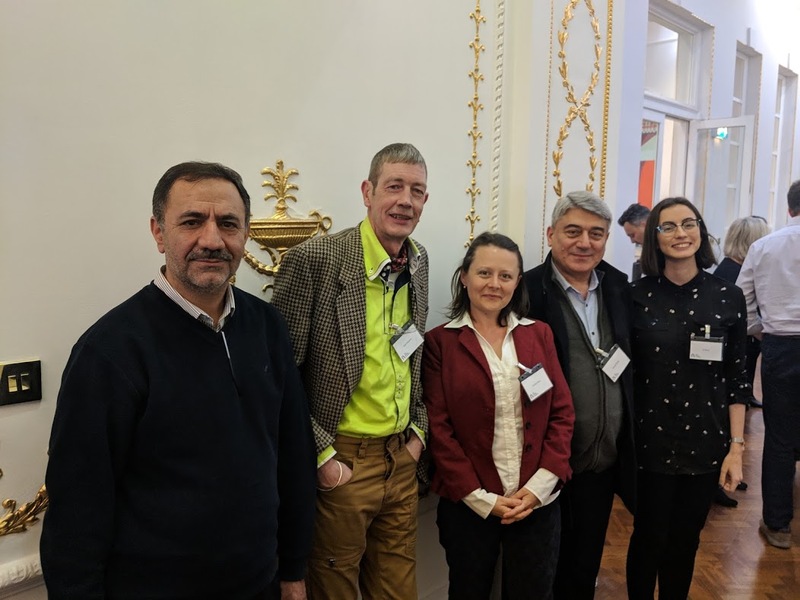 Dr Muir Houston, Dr Lavinia Hirsu, and Dr Jo Neary from our Glasgow team were in attendance, accompanied by two of our international colleagues: Professor Kamal Ketuly (University of Duhok, Iraq) and Professor Nematollah Azizi (University of Kurdistan, Iran). There were 16 projects in total funded under the call, all with a focus on the Global South. While there was a wide variation in the type of work undertaken (for example, a gender sensitive study of safety in public spaces, an exploration of urban dispersal and the impact on social connections, a study on health needs and infrastructure access of refugees, a study on flooding and impact on road infrastructure, and a discussion on developing low cost railroutes), each project utilised both University and city connections to develop an understanding of how cities and infrastructure in their chosen location(s) operate. It was also clear that there was a strong sense of interdisciplinary partnership across the projects- mathematicians working with geographers, social scientists working with engineers etc. The event was in two parts. The first involved projects that were still ongoing, and the second were those who had completed their work and were able to talk about evidence of impact and future directions of their work. However, what was striking was that even in the morning sessions, there was evidence of emerging impact, both in terms of developing knowledge bases, but also with partnerships and capacity strengthening. "This event was like bringing the whole world into one location. So many great projects have taken the challenge to evaluate, describe and capture what it means to live in cities challenged by a multitude of factors, be they human-induced or environment related. More importantly, the research conducted in these spaces has unanimously turned towards the human dimension of city infrastructures, capturing the daily struggles of moving in the city, finding one's path, linking up with supportive systems. What the projects have also revealed is that cities are organisms which we need to continue and explore. I left the event with the strong feeling that this work need not stop because we need to learn and relearn what it means to live in a city like Glasgow, Duhok, Manila, Sanandaj, Dar es Salaam, Harare, and the list is too short to capture all the cities we looked at." The event ended with a comment from Caroline Knowles, who reminded everyone that while this was the final meeting of the bid, it was not the end of the conversation and encouraged everyone to keep talking, publishing, and debating some of the issues that were brought into our awareness during the duration of the projects. We acknowledge the British Academy for enabling Professors Ketuly and Azizi to attend the London meeting.